The Indian SARAL satellite was placed into orbit Monday 25 February from the Satish Dhawan Space Centre in southern India. The satellite is carrying AltiKa, a new-generation radar instrument developed by CNES to tell us more about Earth’s climate. 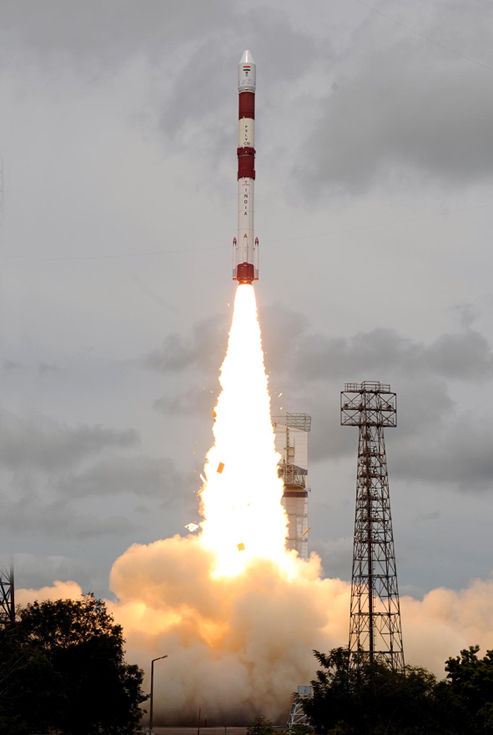 The Indian PSLV-C20 launcher sent aloft the SARAL satellite Monday 25 February from the Satish Dhawan Space Centre. Credits: ISRO. A PSLV-C20 launcher lifted off the pad from the Satish Dhawan Space Centre on Monday 25 February at 17:31 local time, 13:31 CET, sending the SARAL satellite into orbit. The satellite reached its near-800-km orbit after a flight lasting only 20 minutes. For the first time ever, the AltiKa radar, developed by CNES, is set to acquire satellite altimetry data operating in Ka band (35.75 GHz, 500 MHz). At this higher frequency, the instrument should be unaffected by ionospheric perturbations while also affording better spatial and vertical resolution. As a result, it will be capable of more-accurate measurements than its predecessors. The mission’s ultimate goal is to improve observation of ice, coastal zones and continental waters. Alongside other satellite altimetry missions, data from the AltiKa radar instrument will help to develop operational oceanography and forecasting capabilities, and to improve our understanding of Earth’s climate. SARAL’s payload also includes a 3rd generation receiver for the Argos global data collection and location system. This system dedicated to studying and protecting the environment, created in the late 1970s under the impetus of CNES, is celebrating its 34th year in service this year.